Frosted Strawberry Cake Donuts are flavored with strawberry jello and strawberries, then frosted with a cream cheese frosting. Sprinkle with colored sugar if kids will be eating them. If you haven’t found yourself a donut pan yet and you have kids or grandkids, what are you waiting for? I’m having so much fun with mine. 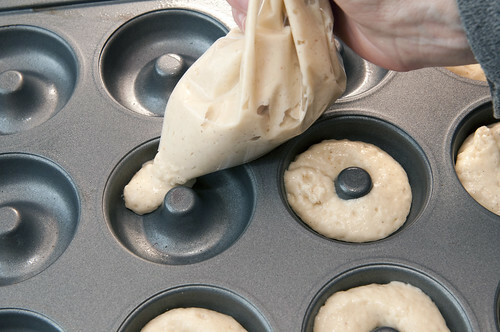 You could use a mini-muffin pan but something about the donut shape makes them irresistible. Instead of white whole wheat flour, use all-purpose unbleached flour. Adding dry strawberry jello powder to the dry ingredients gives the expected pink color and intensifies the strawberry flavor. Substitute 1/4 cup finely chopped or mashed fresh strawberries for the milk. Dress them up for a party with a glaze, flavored and colored with strawberry jello powder. Don’t forget the sparkly or colored sugar! Place the batter in a plastic bag and clip off a corner. Next, squeeze batter into donut pans going around each little post. When I first saw this tip, it seemed like too much trouble to scoop the batter into a plastic bag. But believe me when I say: It goes better, faster, and neater for you with a bag. The batter is a little bit stiff and won’t drop off a spoon easily so the effect ends up looking lumpy and irregular. Preheat oven to 350 degrees. Grease doughnut pan well (I use spray oil with flour in it i.e. Baking by Pam). 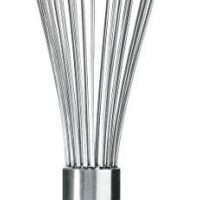 Whisk yogurt, strawberries, egg, oil and flavorings together in a separate small bowl.Pour all at once over dry ingredients and stir only until everything is moistened. 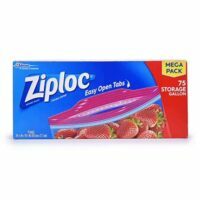 Spoon batter into pastry bag or quart-size zippered plastic bag. Seal. Snip small corner of plastic bag and force dough out of hole in a fat rope that encircles each doughnut cup. Fill only 1/2 to 3/4 full or you will lose the hole in the middle of your doughnut. Makes 12 donuts and possibly 3-4 "donut holes" in a mini cupcake pan. Bake for 9-10 minutes. Combine cream cheese and milk in a medium mixing bowl. Mix powdered sugar and jello powder with cream cheese until smooth. Add more milk (a few drops at a time) if necessary to achieve correct consistency. It should drip slowly without being runny. 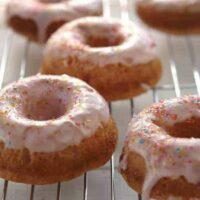 Dip donuts face down into glaze and turn over to dry on rack (see picture) or pour over the top. Sprinkle with colored sugar or other edible decorations, if desired, before the glaze dries. It has come to my attention that mini-donut pans do not all make donuts the same size. I bought mine from World Market and the donuts measure 2-3/4 inches in diameter. Nutritionals may vary according to the size of donut pan you use. 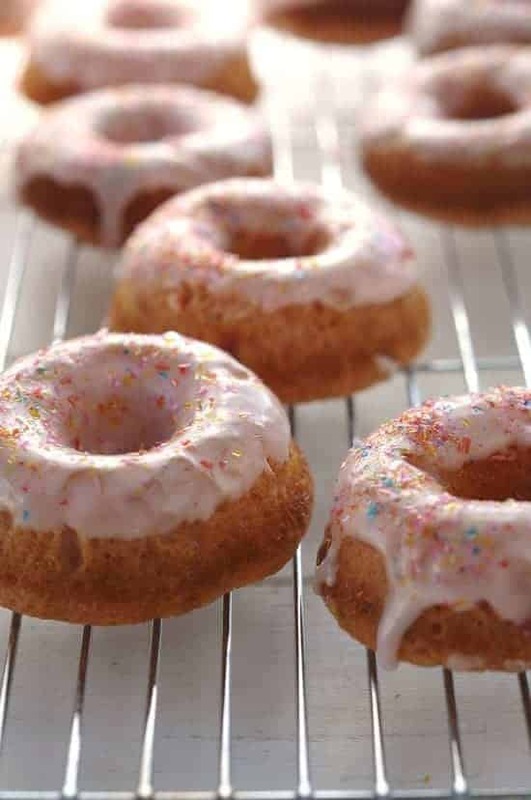 I want to make these now but I dont have a donut pan. Is it possible to make in a cupcake pan half full? Also I love strawberry things and one of the things i learned was using an extract bought at Walmart,Watkins Immitation strawberry extract. This really is good to mix for strawberry taste. Only Watkins. Yes, you can use a cupcake pan instead. Your muffins may turn out slightly firmer than the average muffin but they should still be delicious. Good to know about the Watkins strawberry extract. Thanks so much for writing. I want to make a bundt cake that is a Strawberry Cake Donut with Strawberry frosting. Do you think this recipe would work in a bundt pan? I am so glad you posted this recipe 🙂 I LOVED these, as did Tyler!!! I need to get a pan to make these! Yam Yam yam, Its too tasty, my mouth watering to see all of these pictures. Definitely getting baked here asap. 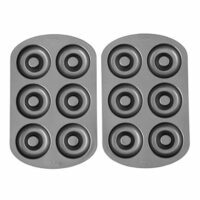 I’ve only used my new donut pan once and I’ve been looking for a great recipe to try a second batch. This is it, for sure! Oh.my.word those look incredibly good! Perfect for a valentine tea! I’ve never tried making donuts, but these sound easy and tasty. These are absolutely adorable. Ellie and i think the sprinkles on top add the perfect amount of cuteness!!!! Yum–this looks so girly and perfect and pink! My niece is only 7 months old, but some day, we’ll have to make and eat these at a tea party. Here’s a link for a crumpet recipe. I use well greased mason jar lids for rings. Fabulous idea to use the mason jar lids. I certainly have plenty of those sitting around. And thanks for the link. I will put that on my list. Your donuts look delicious and I can’t wait to purchase a donut pan and start baking donuts for my grand-kids. (I’m sure I’ll just have to eat a few myself too). Thanks for posting this recipe. I think this is definitely something that Ellie and I can do in the next few days. Just one question, what is Jello and where can you buy it? I am so making these tomorrow. Thank you for this lovely recipe! I tried baked doughnuts a while back, in that same kind of mini bundt pan and they just did not turn out well. I’m sure it was just the recipe and now I want to try these. The boys love donuts, but I really try not to let them eat so much fried food. I posted your French Silk Pie today. It’s really good! Thanks. Katrina, I’m curious as to what you didn’t like about your doughnuts. I did not like any of the recipes I tried in the beginning either which is why I started from scratch using one of my favorite muffin recipes. Basically, I added less liquid (texture better with a thicker dough) and a touch of nutmeg. I’ve also found they are easy, easy to overbake. The mini-donuts bake fast because of the post up the middle. with strawberries it must be so summery! love this idea! These are so pretty and sweet! My girls would be thrilled to have such a treat on Valentine’s morning!